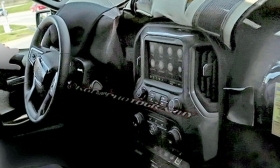 The next-generation Silverado's instrument panel configuration is nearly the same as that of the current version. DETROIT — The front end of Chevrolet's redesigned Silverado full-size pickup coming next year looks to have a less rectangular shape than the current generation, with headlights that slant toward the centre of the grille. A test vehicle photographed while being driven on Detroit-area roads recently was heavily camouflaged and disguised to mimic a Ford F-150, though some details were discernible. Similar to today's version, the truck maintains an LED light strip below the headlights. Canadian Silverado sales were down 3.2 per cent in 2016, when the automaker sold 44,932 units compared with the 46,408 it sold in 2015. But sales rebounded to start 2017, up 18.9 per cent in the first four months during which time the automaker has sold 17,290 units. 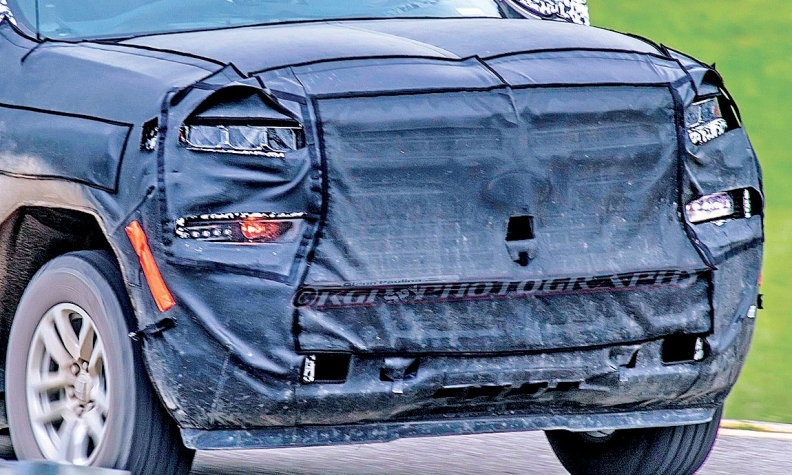 Much of the rear of the redesigned Silverado was hidden when spotted near Detroit, but a side exhaust indicates that GM is testing additional engine options, as previously photographed test vehicles all had twin exhausts pointing straight back. The redesigned Chevrolet Silverado full-size pickup, shown in these spy photos, is expected to launch in the second half of next year. Inside, the vertical instrument panel is configured almost identically to that of the current version, with a large touch screen above buttons and knobs for the audio and climate controls. The display above the steering wheel is covered, which could mean that GM plans an upgrade to digital screens there from the analog gauges on today's Silverado. GM is expected to launch the redesigned Silverado and GMC Sierra in the second half of 2018. The company is temporarily shutting each of its pickup plants for several weeks in the third quarter to retool, an indication that the next generation is drawing closer. Shortly after a new collective bargaining agreement was reached between GM and Unifor in September 2016, Reuters reported that workers at Oshawa will install component parts and do final assembly of pickups using bodies shipped from a GM plant in Fort Wayne, Ind. GM has yet to confirm that it will produce Silverados in Oshawa. Unifor has said the ability to assemble both cars and pickups would allow the plant “to meet unmet demand in a critical market segment." While speaking at the Automotive News Canada Congress in February, GM Canada President Steve Carlisle would only say “a truck” was coming to Oshawa. More recently, a union memo circulated among members said General Motors will add 500 employees and a second shift to build trucks at its assembly plant in Oshawa. “The second shift in Truck will be launched in the second quarter of 2018. At this time it is forecast that another 500 jobs will be added to Truck,” reads the memo, signed by Unifor Local 222 President Colin James among others.